So in this weeks reading Klosterman discussed laugh tracks and the burden to society that they present. Why is it that media thinks that people can’t think for themselves? I’m pretty sure that I know what’s funny, what’s sad, and what’s scary. Still, every time I watch a TV show or a movie I am constantly bombarded with images and sounds that attempt to tell me how to feel. report you see pictures of houses underwater, victims walking through waist-deep water, and buildings such as churches completely demolished. 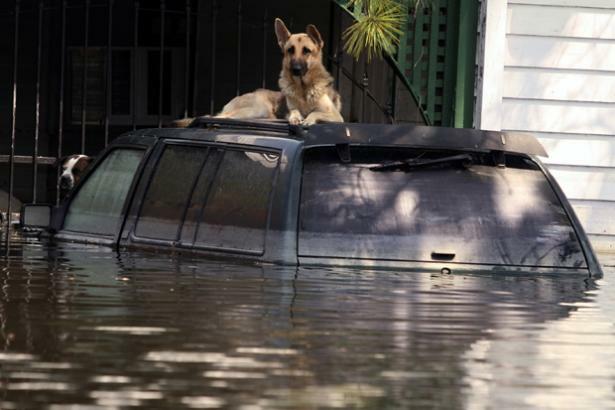 Another common image for news reports to show is animals swimming through the water not knowing where to go as well as animals stranded on things such as the roof of a house or the roof of a car as you see in the picture to the right. This technique is very effective because seeing really is believing. When you just listen to a news story or read a newspaper there is a distance between you and the victims of the story, but when you can see what is really happening the image is burned into your mind and you imagine yourself in that situation. When you see what is happening to other people you can almost feel the emotions that the victims of the story are feeling. Unless you don’t have a compassionate bone in your body it is nearly impossible to not feel bad for someone who’s house has been destroyed or for an animal that has no way to get rescued if you can visually see the damage. This technique is very well thought-out and can really get a story to stick with a person. So the moral of this story is that you need to prepare yourself for the most depressing images that the media can dig up when watching a story about a natural disaster, that way you won’t be surprised and you can refrain from crying. I love to do anything outside, I especially love to golf! I enjoy listening to all types of music, catching up on all my favorite television series, and playing an occasional video game. This entry was posted in Uncategorized and tagged Assignment #2: Manipulative Media Techniques, Hurricane Katrina, Media Tricks, Stranded Animals. Bookmark the permalink.